Numerous emails have been coming in about what is “Big Bang” that we originally forecast at the 1985 Conference. To put this in plain cyclical terms, there has not been a trend that lasts for more than 26 years without serious change. Originally, the depression that followed 1873 lasted for 26 years with reactions of course until the major bottom in 1899 when interest rates reached nearly 200% in the USA. This depression was originally called the “Great Depression”. 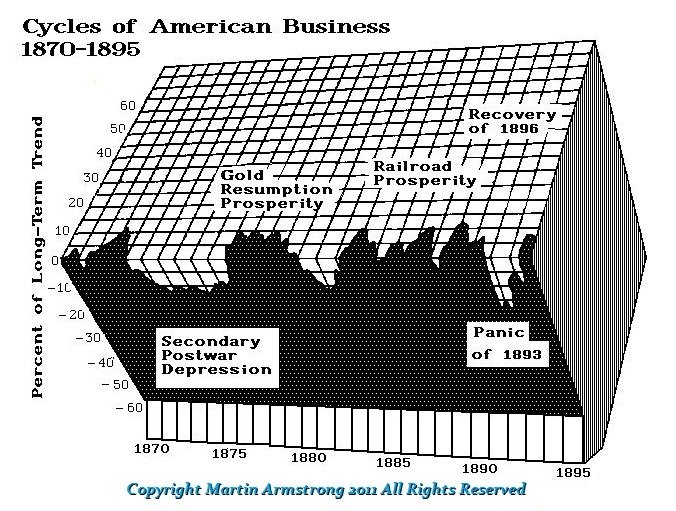 That total was switch to the “Long Depression” after the collapse from 1929 into 1932. This decline was protracted because of the Silver Democrats trying to support the silver miners. They overvalues silver fixing the ratio at 16:1. The hope was to force silver to rise, but in fact the opposite took place. 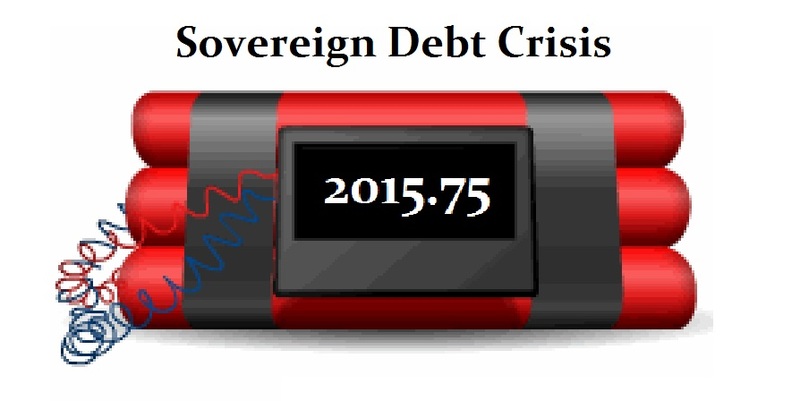 We warned that Japan would enter a Great Depression that would also last for 26 years from 1989.95. The final low for Japan economically should materialize in 2016. This is where Japan may see a dramatic political shift akin to Britain abandoning the gold standard on Monday, September 21st, 1931. Britain leaving the gold standard even demonstrated to the world that austerity supports bonds holders at the expense of the people. 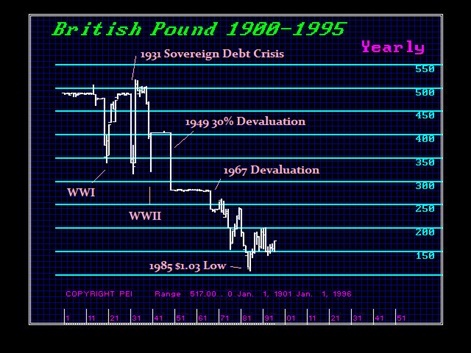 September 21st, 1931 was an historic date; the suspension of the gold standard in Great Britain came only after the six years of painful effort of austerity followed the country’s return to gold in 1925 out of pride rather than practical economics. We warned that 26 years from 1985 and the birth of the G5 at the Plaza Accord would mark the start of the economic decline. This gave us the target of 2011 – the breakout for the Dow. 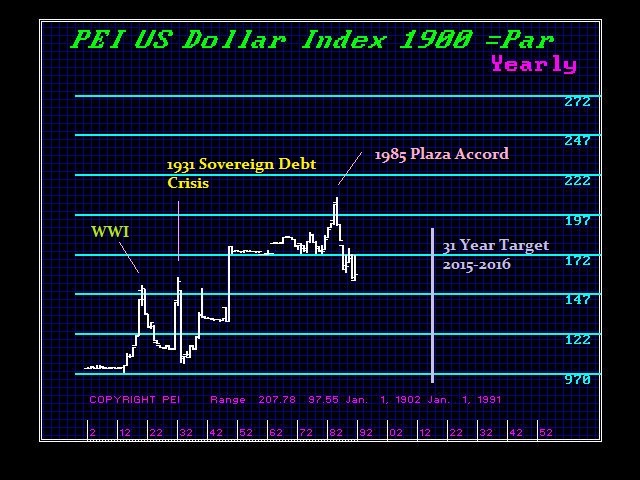 However, the target for Big Bang would be 31.4 years from the Plaza Accord. That brought us to 2016. 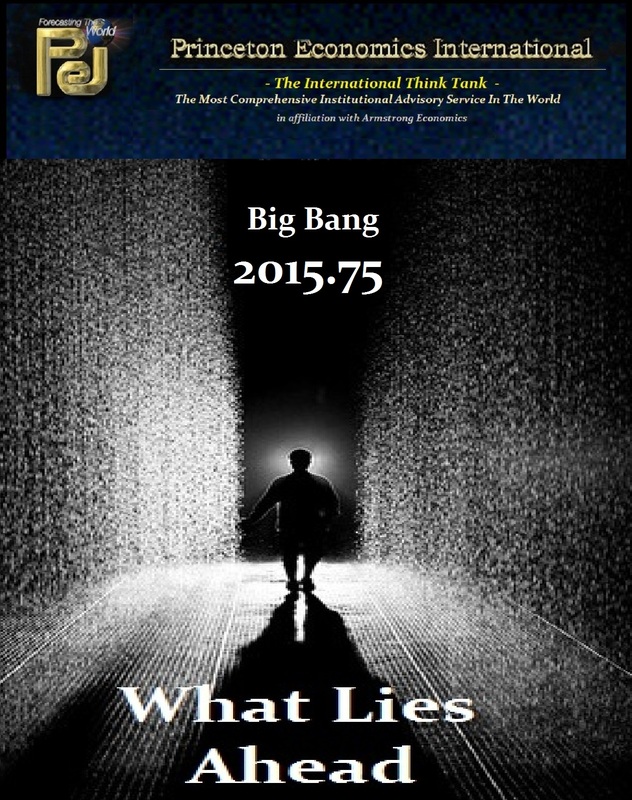 After the first of the year we will be issuing a Special Report in Big Bang and what we face the other side of 2015.75. The traditional analysis will preach that the stock market will crash. However, that may have been the events in 1929, but what happens when the crisis is in government? Will the stock market crash and then you run to government and pay them 5% to hold your money with negative interest rates? It takes a major historical database to track HOW capital responds under different set-ups. It is not a one dimensional world with just 1929 as the outcome. Nor is it a hyperinflationary world of Revolutionary Germany and the collapse of the Dmark. If the future were truly that simplistic to figure out, then everyone can do that so why bother with any analysis? We will let clients know when this report is ready for delivery. It will be an eye-opener to say the least. Once we have the year-end closings, the report will be set to roll.